I typically track my interest in Houdini back to my first viewing of the classic Tony Curtis Houdini biopic on November 16, 1975. But the truth is my first encounter with Houdini came much earlier. So this is my strange confession. I have no idea what age I was, but when I was very young, we had a turtle that we kept in a shallow fishbowl on a kitchen counter top. Somehow the turtle was able to escape his bowl, get down from the counter, and get inside a closet. The turtle did this three times, at which point my parents named it "Houdini." It was then my father explained to me who "Houdini" was. I can vividly remember this moment. He told to me Houdini was a man who lived long ago and who could escape from anything and never failed. This information blew my mind, especially as I was raised with no religion whatsoever. This was really the moment that I learned of the miraculous; that a seemingly supernatural man once walked the earth and proved his powers to all who challenged him. Damn! Flash forward to 1971 when, like so many of my generation, I watched some pretty trippy children's television. One of those shows was Lidsville, produced by Sid & Marty Krofft. What I really liked about the show was the opening song which told the story of Mark (Butch Patrick of Munsters fame) who dared to sneak into a magician's dressing room to discover the secret of his magic hat. 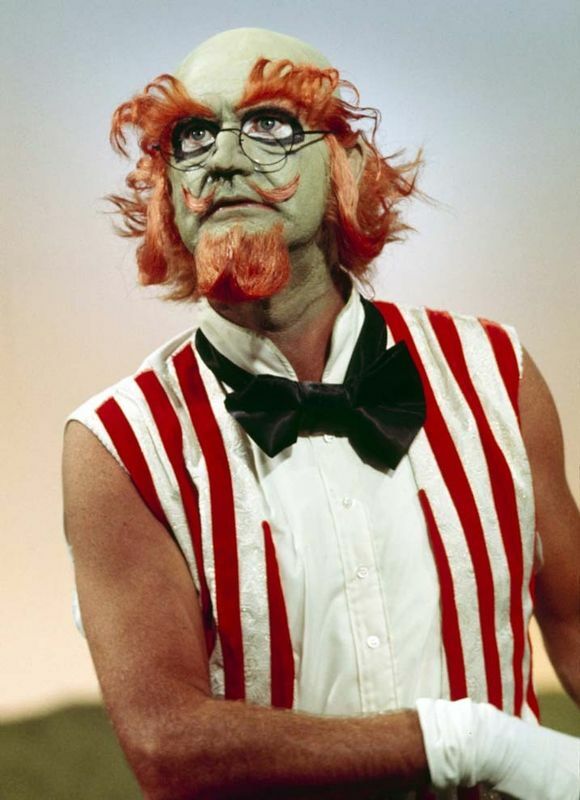 This sends Mark into a psychedelic land of "hat people" ruled over by an evil magician named The Great Horatio J. Hoo-Doo, played by Charles Nelson Reilly. Check out the full opening below. Who makes women's hearts go twitter? Who makes husbands all turn bitter? I don't know how long this idea remained in my head, because beyond the credits, I lost interest in Lidsville, which only lasted 17 episodes. But the idea of Houdini was planted deep within me, and I was starting to pick up on pop cultural references, such as the name Hoo-Doo. So, yes, my earliest conception of Houdini was some kind of a cross between Jesus Christ and Charles Nelson Reilly. And when Tony Curtis arrived on the scene, complete with his martyrs death and a promise of resurrection, I finally decided, "Okay, its time to find out the truth about this guy." For the full story of Lidsville, check out this terrific post at Cult Oddities. Below are links to some more, less psychedelic appearances of Houdini on children's TV. I remember H R Puffinstuff, Witchiepoo, and that little flute that could talk. Poor Jimmy--Jack Wild--grew old and died of cancer. This is great. I think I watched all 17 of those episodes when I was a kid. By the way, what was the turtle's name before it started escaping? Ehrich? Haha! Nice one. I'll have to ask my sister if she remembers that turtle. I have a feeling it was hers. Never heard of this show. I was out of school already so I don't think I'd be watching a kids' show then. My first introduction to Mr. Houdini was Tony Curtis' movie that was aired on tv at some point during my preteen years. I had an interest in stage magic and was becoming very proficient in sleight-of-hand. Houdini was unknown to me at that point. I don't recall the date of when I saw the movie but I remember being blown out of the water by it. I asked Dad if this guy (meaning Houdini) really lived or was this some sort of fantastic fiction. My Dad assured me that Houdini had been a real flesh-and-blood individual who actually did the most amazing escapes and magic tricks. I made a mental note to learn more about this man and to check the library the next time I went there. And through the years I've kept my eyes open for any articles that would tell me more about this fascinating man. Your website is something I just stumbled on because one of your posts somehow appeared in some other place online. I enjoy your website very much. That Tony Curtis movie certainly brought a lot of people to Houdini. And even though it was an older movie, it was always an event when it aired on TV, receiving a nice large ad in the TV Guide. Glad you found my site, Margie! I remember watching that show and others like HR puff and stuff and sigmond and the sea monster. I had a similar experience with a kitten that kept escaping a box we had the litter in. She was named Houdini. Good stuff John! The same thing happened to me, but it was different character. It was in the 60s and some actor played a bad magician with a name which was a knock off on Houdini. I cannot remember it now. All I can remember was that I too thought that was Houdini. So, as a kid, I grew up thinking Houdini was a bad magician. I heard everyone telling how great he was and I just assumed that maybe when he was until he got old. Then as a teenager I got into magic and read about Houdini and could not understand my confusion.